A review of several sources indicates that most consumers like the Westin Heavenly Mattress. See consumer ratings below. The Westin Heavenly Bed comes with a box spring, pillow-top mattress, down blanket, three sheets, five pillows, bed skirt and duvet. They can be purchased through Westin’s online store as well as at Nordstrom’s (note: Amazon also have a large array of Westin Heavenly Bed products available). 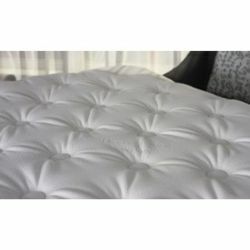 The Westin Heavenly Mattress itself is a medium-firm, thirteen-inch, pillow top Simmons mattress that uses the patented pocketed coil design (each spring is encapsulated in it’s own pocket of material). The Westin Heavenly has 850 pocketed coils. For comparative purposes the Simmons Beautyrest Classic (the entry level Beautyrest) has 800 pocketed coils while the next step up, the World Class, has 980. All coils counts are based on a queen size mattress. - Cotton/poly blend: 230-thread count deep pocket fitted sheet, decorative flat middle sheet with taupe piping, top flat sheet, and pillow case pairs. - 100% Egyptian cotton: 230-thread count deep pocket fitted sheet, decorative flat middle sheet with taupe piping, top flat sheet, and pillow case pairs. - 100% Egyptian cotton: 300-thread count deep pocket fitted sheet, decorative flat middle sheet with taupe piping, top flat sheet, and pillow case pairs. Made in Italy. - 100% Egyptian cotton: 300-thread count, white-on-white striped deep pocket fitted sheet, top flat sheet, and pillow case pairs. Made in Italy. Also you have a choice of matching box spring. Either standard (at 8.75 inches) or low-profile (at 5.5 inches). The mattress warranty is for 10 years (against workmanship defects). This is perhaps a little shorter than one would expect. Many other mattresses have a 20-year warranty or sometimes even 30 years.